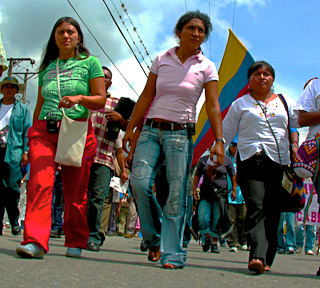 In Columbia’s war-torn indigenous villages, three brave women use nonviolent resistance to defend their peoples’ survival. Warfare between the guerrillas, paramilitary groups and armed forces imperils Colombia’s 102 aboriginal groups, dozens of which face extinction because of the violence. Despite being trapped in this predicament financed by the drug trade, native women in Colombia are leading and creating transformation imbued with hope. WE WOMEN WARRIORS (TEJIENDO SABUDURIA) bears witness to neglected human rights catastrophes and interweaves character-driven stories about female empowerment, courage, and faith in the endurance of indigenous culture. The film has been successful on the international festival circuit after premiering at the 16th Annual Academy Awards-qualifying Docuweeks in New York and L.A.
Nicole Karsin covered Colombia’s armed conflict as an independent journalist for a U.S. audience from 2002-2009. She formed Todos Los Pueblos Productions LLC to move audiences to action through artful, character-driven films about global struggles for human rights and dignity in 2007. Karsin holds a BA from Sarah Lawrence College and an MS from Columbia University Graduate School of Journalism.